Have you read the book? If not, be honest with yourself – do you think you are likely to ever read it? Clear the kitchen counter – The poor kitchen counter. It’s a dumping ground for all sorts of stuff: school notices, hair ties, shopping bags, receipts, etc. Don’t worry! You can conquer kitchen counter clutter. You just have to start somewhere. Recycle unneeded papers and put away items that belong elsewhere. 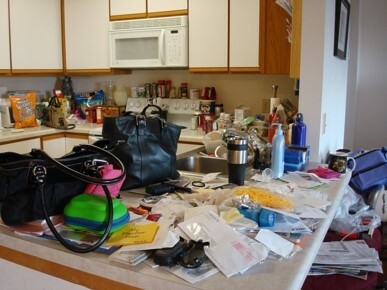 If you need a drop-spot on the counter (because face it…you’re probably going to put more stuff there tomorrow), make it a clearly defined zone to prevent clutter sprawl in the future. A cute bowl for pocket change or a decorative tray or basket for mail will look nice and keep things neat and orderly. Make space under the kitchen sink – If you haven’t looked under your kitchen sink in a while, you might be surprised to discover that it has become a storehouse for random cleaning products, plastic bags and miscellaneous tools. Pull it ALL out! Give the cabinet a good cleaning. Then only replace the items that you actually use, that are full and in good condition. Recycle empty containers, and move items that belong somewhere else to their appropriate spots. Create a calm oasis on your bedside table – How can you rest peacefully when a cluttered nightstand is the last thing you see before closing your eyes to go to sleep? And chances are you start your day feeling discombobulated because the disorganized mess is also the first thing you see in the morning. Clear away the toppling pile of books, scribbled notes and old water glasses. Wipe off the dust – it’s time for a fresh start. Replace only your current reading, a journal and pen and perhaps a meaningful photo in a frame or small vase of flowers. Go through your wardrobe one drawer at a time – Trying to tackle your whole wardrobe at one time will feel like a staggering task. Instead, set a timer for 30 minutes and start with a single drawer. Keep working your way through your clothes one drawer at a time until the timer goes off. Eliminate items you know you won’t wear anymore. If they are in good condition, pack them up to donate. If they are too worn out to donate, you can drop them in a textile recycling bin. Simplify the linen closet – If your linen closet is a jumble of towels and sheets that you’ve been accumulating for years, it’s time to purge some of the old ones. Take 30 minutes to sort out your household linens, pulling your least favorite (or most frayed) sets to bring to a textile recycling bin or a charitable donation center. Clear your desktop – It’s next to impossible to concentrate when you’re trying to work at a desk with a mountain of “stuff” on it. Set a timer for 30 minutes and have a desk clutter-blasting session. Sort and file important papers, shred and recycle unneeded documents, test the pens in you pen cup (hint: throw out the ones that don’t work), and clear out the drawers. Work tasks will be much more pleasant with a neat and tidy desk!